Your article on the 22nd Amendment in the Colorado College Bulletin for November 2013 was excellent. This amendment changed — for the better — how we do our political business. Let me propose for your consideration a pair of other changes designed to eliminate two problems with our present legislative system at both the state and federal levels. First, under our present system, a large portion of the voters, sometimes even a majority, are not represented in the legislative body because they voted for a losing candidate. Second, a candidate who was elected by only a very small plurality wields as much power in the legislature as one who received an overwhelming fraction of all votes cast. The following pair of proposals, applicable to at least the lower houses of state and national legislatures, eliminates both difficulties. First, both the candidate who received the highest number of votes and the one who received the next highest number are declared elected. Second, in the legislature each member casts as many votes on each issue as that member received when last elected. With these two changes in place, every voter except those who voted for a minor party candidate will be represented in the appropriate legislature. Further, each voter’s vote will have an equal effect on legislative decisions. It is possible that minor parties might squawk that, under these provisions, their candidates will never be elected and their voters will be no better represented than in the past. There are at least two answers to this objection. First, their adherents are not represented now. Second, a minority party candidate has a better chance of being elected under the new rules than under the old ones. Under the old rules, a candidate from any party had to draw the most votes. A minority candidate had to draw more votes than the candidate of the most popular majority party. Under the new rules, the minority party candidates need only draw more votes than the candidate from the second most popular party. While there may be some practical objections to these two provisions, such as either increasing the sizes of legislatures or of electoral districts, I do think they deserve serious consideration. It was with such pleasure that I read of the mural in Cossitt Hall dedicated to Hanya Holm in the latest issue of The Bulletin, November 2013. I was fortunate enough to study with Hanya during the summers when I was a student at CC. After graduation she invited me to try out for my first Broadway show titled “Christine.” It only lasted for 10 days in New York, but it was my initiation to the Great White Way. A year later I was lucky enough to secure a dancing role, with a bit part and a little singing thrown in, in the original cast of “Camelot.” She was a great mentor to many dancers and I shall always be grateful for both Colorado College and Hanya Holm. I was saddened to learn of the death of Doug Freed. While I never had a class from him at CC, we got to know each other in Chicago, where he was spending a sabbatical and I was working on a Ph.D. We would occasionally meet for coffee or a meal, and Doug never failed to take personal interest in me. What especially impressed me, though, was how much he loved just to think: about books, contemporary political events, music, or life meaning. He truly had a gift for thoughtful conversation. I am thankful for him. In the November 2013 issue, we neglected to credit Julia Belamarich ’14, whose artwork provided the backdrop for the cover. Her talent was showcased in her thesis show in the Taylor Theatre March 31-April 4. The redesigned Bulletin has generated a lot of response; we appreciate all comments, whether negative or positive. The changes implemented were in response to feedback we received through focus groups and surveys, and reflect the updated look that many alumni wished to see in the magazine. 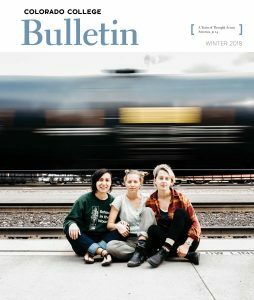 If you prefer to read the magazine online, visit https://sites.coloradocollege.edu/bulletin/. I just received my CC Bulletin — the best ever. Kudos to all those involved in the new style and format! You invited our comments in your redesigned issue, and I’m happy to respond that you look wonderful. I’ve never enjoyed reading an issue more. Format and layout is particularly clear, less cluttered and distracting from the content. I spent more than my usual amount of time reading and look forward to future issues with excitement. That said, I’d like to see a complete list of editors and staff names and emails where we can reach you. Take credit when credit is due. I just received the latest issue of the CC Bulletin yesterday. I have to tell you that I absolutely HATE the new design. The graphic layout and what’s printed on the pages are fine. The problem is the size of the publication. It was so large and so stiff that I could barely get it out of my mailbox. It is cumbersome to hold and read, requiring me to sit at a table to look through it as it is uncomfortable to page through it while sitting on the couch or chair in my living room. I used to keep the Bulletin around for a few weeks to go back and read articles that I didn’t have time to when I initially paged through it, but as this issue is too large to be conveniently stacked with other magazines I have, I won’t be keeping it around. It will go straight into the recycling bin; hopefully I didn’t miss anything interesting the first time through. I hope you will reconsider the design of the publication. Again, the content is fine, but the size needs to be reconsidered. Ideally, I’d like the next issue in my mailbox to look like the issues I have received in the past. Just to let you know — since you ask — I loved the story about Dr. Linkhart and “his” owls and the Peak Profile of Jeri Hibbard — good for you, lady! I also was happy to see recognition of Bill Swagerty’s monumental book on Lewis and Clark. BUT I hate the new format, my wife almost threw it away as junk mail based on its size — too big, doesn’t fit in the mailbox — too much like a lot of junk mail we get! Dale McNeal ’62, Professor Emeritus, University of the Pacific, Stockton, Calif.